Once upon a time, I wanted to create a design element for my friends’ DIY wedding reception that would wow them and their guests. Knowing that the bride, Charlotte, wanted a way to integrate some photos of her and Katie from their wedding ceremony, which happened a few weeks prior, I wracked my brain thinking of how to do so in a fun, innovative way. 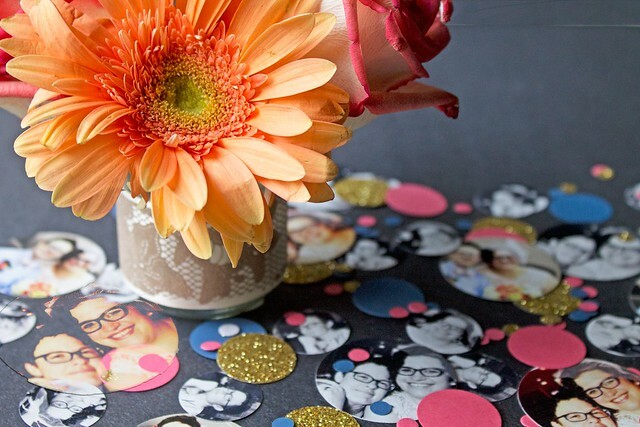 That’s when I landed on what is probably my all-time favorite DIY idea to date: photo confetti! This was it! The party idea I had been searching for and after seeking out the right tools and templates, and selecting the perfect shades of coral and navy to match their colors, I was well on my way. Before I knew it, I had cups filled with varying sizes of their faces betwixt pops of color and a bit of gold glitter. I was stoked! This would be the perfect final touch on their wedding reception’s welcome table! And it would have been…had I remembered to put it out. Wah-wah. Truth is that we were so busy finalizing appetizer trays, piping whipped cream rosettes, and readying ourselves that the final moments of party prep saw my lonely bag of confetti abandoned on a bookshelf, forgotten, until I was home, showered, getting into bed, and suddenly I remembered it! What followed was one of my best cursing streaks yet. Sigh. I guess Virgos mess up after all! This doesn’t mean that we can’t still have a tutorial though and, of course, there are still pictures to ogle and inspire your own varieties. 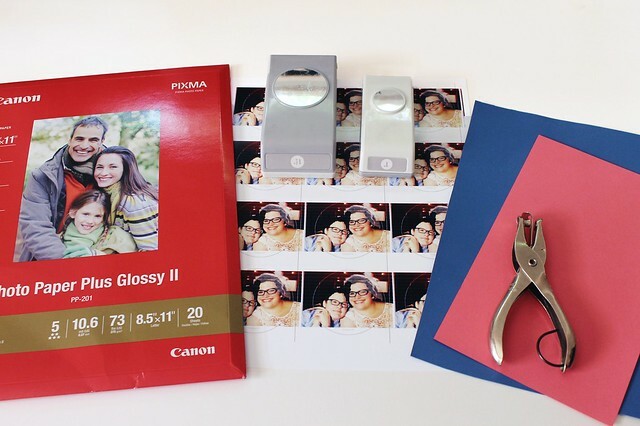 This project comes together much easier than you might think and, truly, the only potential drama of the whole thing is that you’ll want to make sure you have full ink cartridges on your printer or ones very nearby. 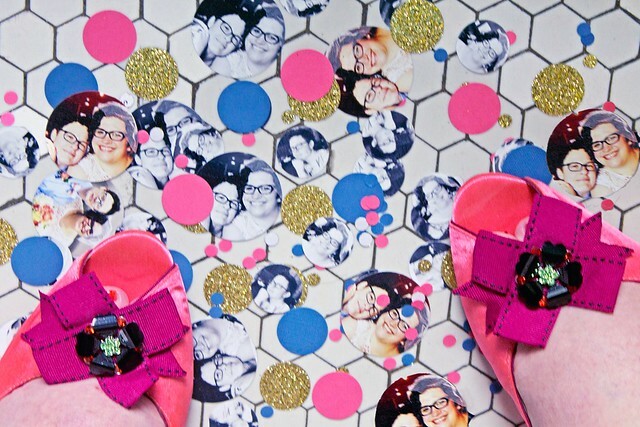 Or, better yet, you can skip all the at-home printing and upload and order photos fresh from somewhere like Shutterfly, which would definitely cut out the only time-consuming part of this project; I suggest ordering your prints first and then choosing the sizes of your dots. If you go the at-home, DIY route, you’ll need access to Photoshop or some kind of similar photo editing program that gives you the option to create patterns and fill images with them – I hear Open Office is good for this, but I’ve never tried it. I have access to Photoshop CS5, so my directions are based on that particular software and version; I’m happy to try and help troubleshoot in the comments if you run into any issues. There is also a pretty foolproof video made by someone much more qualified than me to explain this whole pattern/fill process we’re going to undertake, so I’ve linked to that below too. I knew from the start that I’d be using some hole punches (you can’t even imagine the mess it would be if I tried to cut these out freehand! Oy! ), which you can find in the scrapbooking section of your craft store or on Amazon, and decided on two sizes – 1″ and 1.75″. I used the 1″ punch for individual shots of Charlotte’s and Katie’s faces and then used the bigger punch for shots of them together. What I was less clear on was how I could print the images in a way that would allow me to easily punch out the areas (close-ups of the faces) of the photos I wanted to, within the dimensions I needed, and also without wasting a ton of ink printing out whole 4×6 photos. Tricky stuff – but easily mastered! Thank goodness for Bear who quickly suggested trying to find a Photoshop-friendly template for a button maker online so that I’d have the exact size I needed for the confetti dots and with an allowed rim for bleed – meaning, in case I cut a bit outside where I had intended, I’d still have a little room within the photo itself and wouldn’t be cutting outside it onto the blank photo paper. Admittedly, this wound up happening a few times any way just because when I initially started punching out photos I did so with the photo facing up, obscured by the punch, so my aim was sort of a guessing game. I soon realized, though, that if you flip the photo image-side down, you can see where you are about to cut by turning the punch over, as the underside of the punch is exposed. That observation made this project a lot easier. You’re welcome. After a quick bit of searching, I found these templates to be exactly what I needed and once I lined up the image in the template through Photoshop, I was able to create a quick pattern out of it (more details below), and then fill a page with my image repeated over and over on it. Once the sheets of photos are printed, the punching out goes quickly. 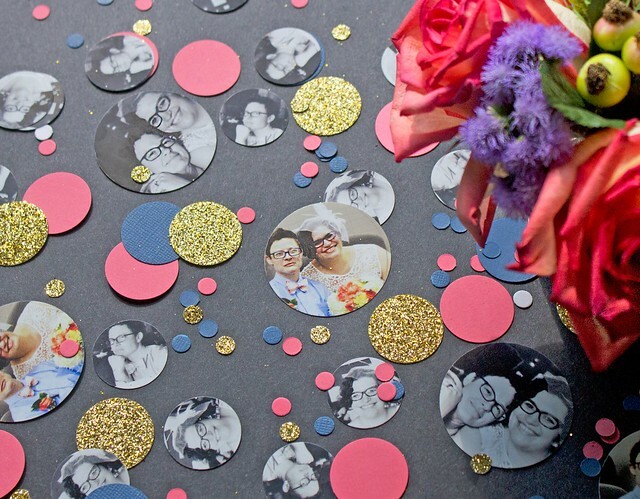 I supplemented the photo dots of the confetti with, as mentioned above, some coral and navy 1″ dots, as well as some gold glittered ones because glitter only increases the wow factor of all things, amiright? 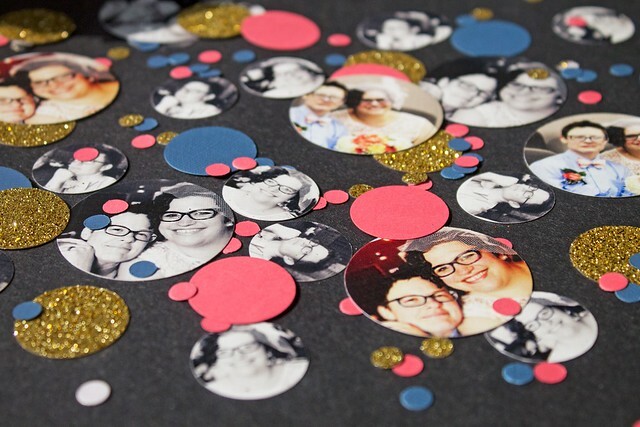 I also used my old, reliable standard 1/4″ hole punch to punch out some much smaller dots in order to bulk up the mix and make it a bit more like your standard confetti. This is such a sweet idea for wedding decorations, or even ones for an engagement or bridal party. I can see incorporating photos of the couple as kids, or awkward teens, to make them really fun! Outside of weddings, though, the confetti is great for pretty much any special occasion – birthdays, anniversaries, Valentine’s Day, etc. It’s a great, inventive way to add a personal touch to a party and celebrate a certain someone(s). It’ll be the talk of the event – just remember to put it out and use it liberally! This stuff is made for fun! 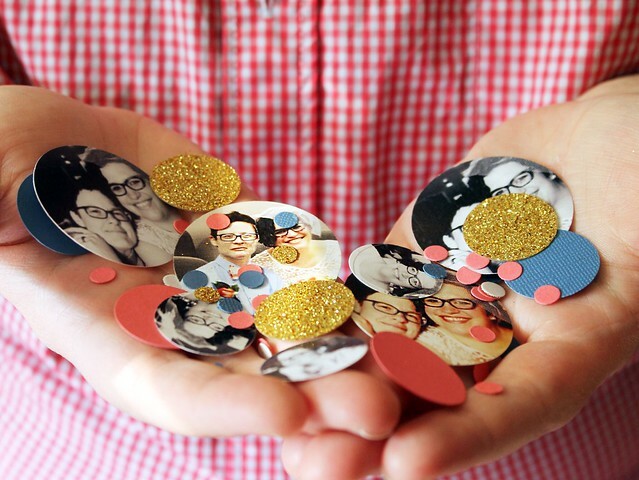 Think you’ll try making some photo confetti of your own? Have you ever helped a friend or family member with their wedding décor? What did you make? Would love to hear from you in the comments! Download the templates you will need that match the size of the hole punches you intend to use for the photo dots. Once you’ve opened the templates in Photoshop, paste in your photo, making certain that it resides in its own, new layer below the layers labeled “cut line” and “face line.” The “face line” marks the edge of your image within the dimensions of the template. For example, if you select a 2″ template, the “face line” is the end of the 2″, so what you want to punch out with a 2″ hole punch needs to be within this circle and aligned accordingly. The “cut line” represents the edge of the bleed area in the event you cut a bit beyond the face line or, in the case of this being made to make buttons, the space between the “face line” and the “cut line” is what would wrap around the edge of the button. The video tutorial at Buttonmakers.net is a good resource for understanding this process better, as well as creating a pattern from the photo, which is our next step. Once you have pasted your photo into the template and adjusted it accordingly to the “face line,” (you may need to change the size of the image in order to get it to fit) hide the “face line” by deselecting it in the layers frame so that it disappears from your image. Next, go to Edit >> Define Pattern and name your pattern something discernible, i.e. Char Face. Your pattern is now saved and ready to use! Open a new Photoshop document that is size 8″ by 10″ and set the resolution to 300 pixels/inch. With the new, blank image open, select Edit >> Fill and then on the “Use” menu, select “pattern.” Below this, you will have the option to choose your custom pattern. Select this drop-down and find your image within the library. Depending on how many patterns you have, you may need to scroll through to the bottom to find your newest one. Select your pattern and then click “ok.” The new, blank image will fill itself with as many iterations of your image it can to allow for on an 8.5″ x 11″ page. You may now print this on a sheet of glossy photo paper. Once the photos are printed, you can punch out the images using your hole punch that matches the size of the template you used; as a point of reference, I got 12 1.75″ dots out of my 1.75″ template. After punching out all of the images on the periphery of the paper, you may need to use scissors to free up the inner area so that you can punch those dots out too; my hole punch couldn’t extend that far into the page from the paper’s edge. When punching out your photos, turn the image upside down in order to view it from the underside of the hole punch. This will allow you to see what you have lined up to punch, so that you can make sure your image is centered, within your margins, etc. Print and punch as many images and sizes as you desire and follow suit with some dots of scrapbook paper or card stock to integrate colors and textures in your custom blend. If your event is outdoors, you may want to stick with paper that has a heavier weight to it so that it does not blow away. Incorporate a sizable amount of 1/4″ dots in order to really stretch your confetti, but to also increase its tossability …that’s a word now, I swear.